How Old Is “Too Old” for an Air Conditioning System? Should I Call for Maintenance When My Heater’s in Trouble? Your air conditioner probably isn’t running right now, and you may not have to turn it back on except on occasional days for the foreseeable future. After all, it’s late autumn now and the official start of winter is less than a month away—this is what we in the HVAC business called the “heating season,” when furnaces and other heaters do the heaviest of their workload for the year. But after saying all that, we still assert that air conditioning repair in Haughton, LA still matters, regardless of the season. We’ll explain further below. First, let’s address the issue of delaying an air conditioning repair at the end of the cooling season. If you noticed something not quite right with your AC during the last month you were using it regularly, you may have decided to wait it out, then maybe get around to scheduling service for it when you need the air conditioner again in spring. Please don’t let your AC sit through the fall and winter with a malfunction of some kind! Air conditioning repairs should be done as soon as the problem is detected. Letting the AC shut down for the heating season with a potential malfunction can have serious repercussions. 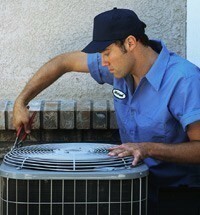 It may lead to the air conditioner breaking down if you should need it during a short heat wave. The problem can worsen while the AC sits unused, leading to a more expensive repair down the road. And you may discover the air conditioner won’t work at all when the spring warmth arrives. If you have to turn your air conditioning system on during the winter—and this is always a possibility—don’t delay with any repair work it might need. It’s easy to dismiss something like strange sounds, odd smells, or uneven performance from an AC when you only need it running for a short time. But as with a leftover problem from the summer, allowing a malfunction to go without repair can result in major damage to the system. You’ll end up with a bigger repair, wasted power, and a system that may need an early replacement. The bottom line when it comes to air conditioning repair: You shouldn’t be running your AC if you think it has a malfunction of any sort. It’s similar to trying to run your car for long distances when the engine warning light has come on! It’s time to call a mechanic—or an HVAC technician—to investigate. It doesn’t matter if the car is going to be parked in the garage for months or you don’t think the AC will need to come on until March. It’s not an ordeal to have your air conditioning system looked at if you suspect it needs repairs. Call our team, and we’ll send out one of our skilled technicians to check out the AC. If you have an urgent repair issue, we have 24-hour emergency service to see you have the help you need on the double. Call the Doctor of Home Comfort! Hall’s Heating, Air Conditioning & Refrigeration serves Shreveport and the surrounding areas.